We’ve had our tree up for the past 2 weeks but it took as long to be camera-ready. 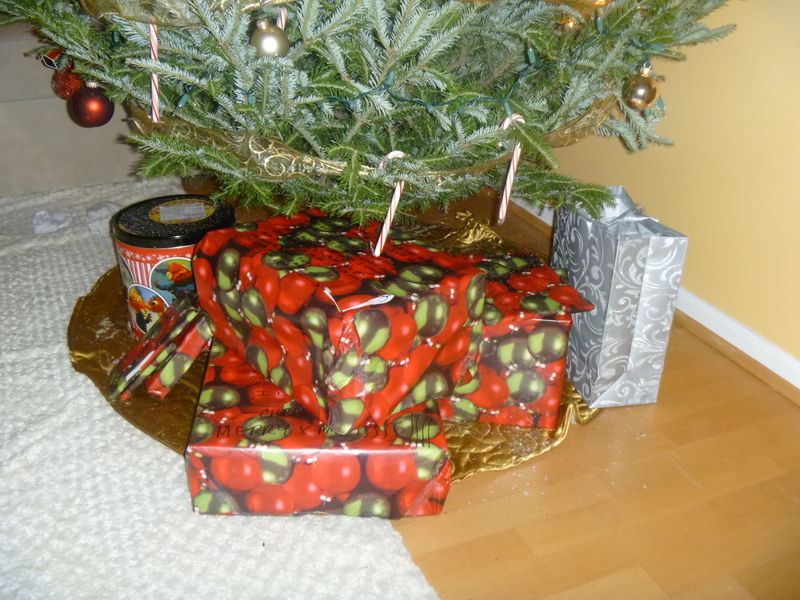 In addition to a light snafu…as in we didn’t buy enough…we also had no wrapped gifts under the tree. 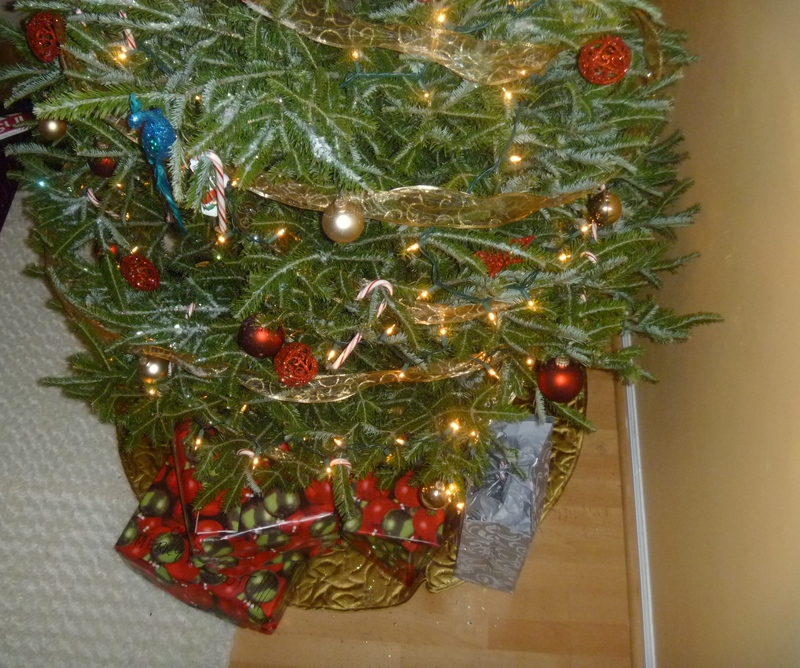 And a decorated tree without some holiday joy underneath is nothing more than a mischief night spectacle. 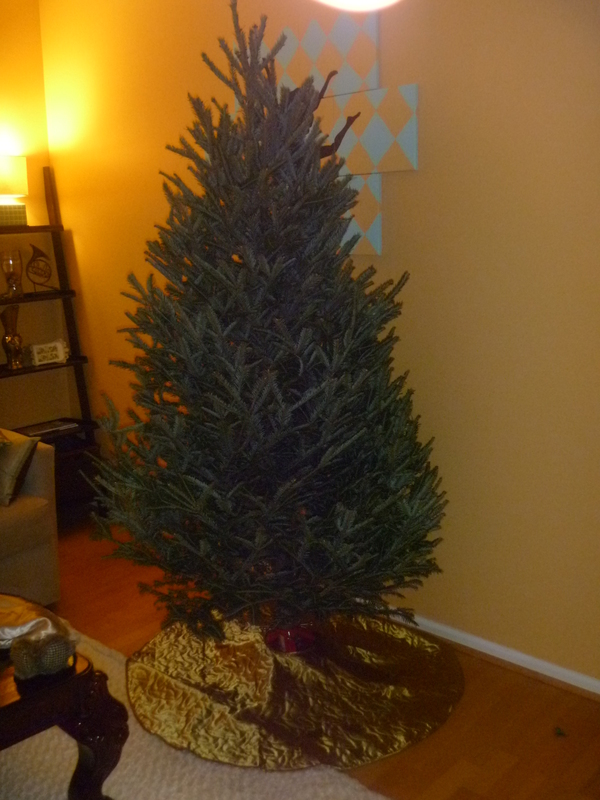 Chris and I went to 2 different tree farms before relinquishing to the $50 price tag for a 6½ foot tree. Since we’re new to the area and only knew of a few tree farms that we pass during our daily commutes, we figured that we could possibly end up spending more on gas and time looking for a less expensive tree. (The next day we passed the Produce Junction 2 blocks from our home with a sign that read “All Trees: $27”). The lessons we learn. 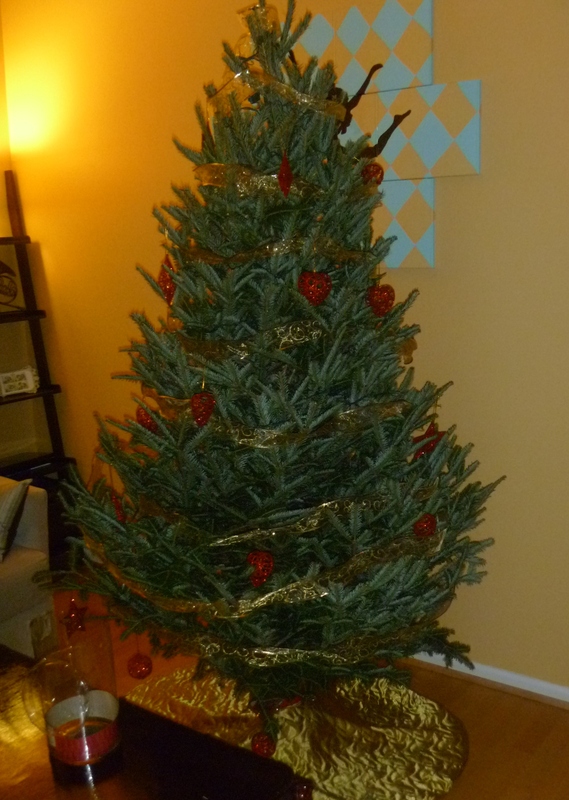 As this year marks the first time Chris and I would have our own tree, we were faced with many decisions that would affect all future Christmases. 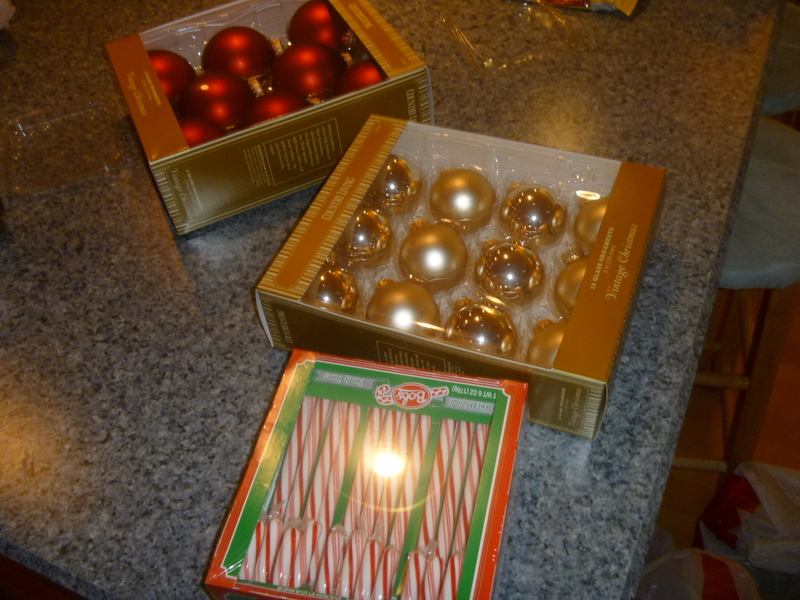 Having no decorations already, we also had to buy the tree stand, skirt, ornaments, etc. etc. 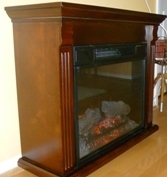 that we will continue to use year after year.A trip to Kmart and $100 later, we were ready to begin. My family has always used a real tree. My dad would have it no other way. 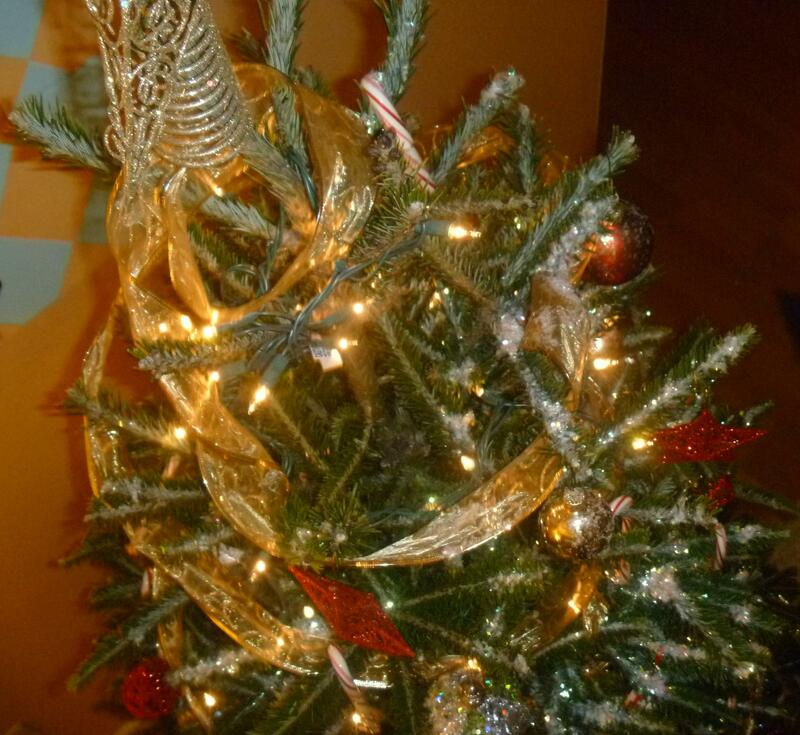 Chris’ family uses a fake tree. 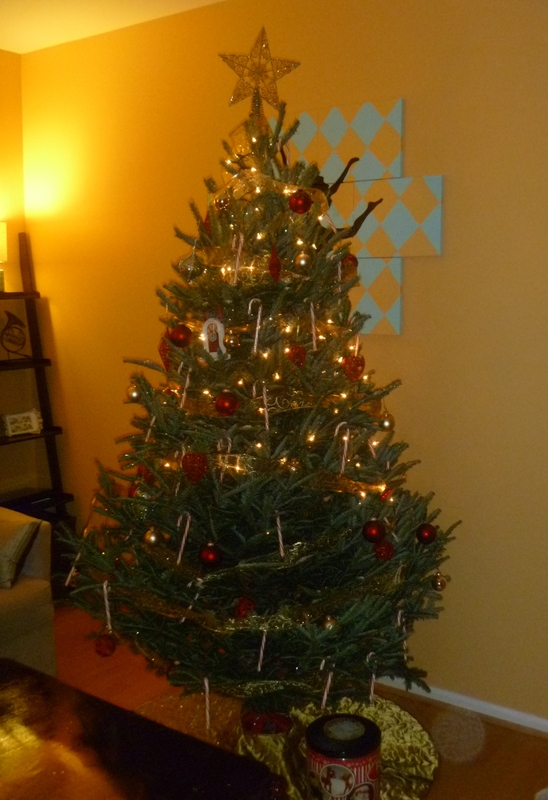 A fake tree may be more practical and would eventually prove to be less expensive, but having nowhere to store a tree 11 months out of the year, we had no choice but to go real. 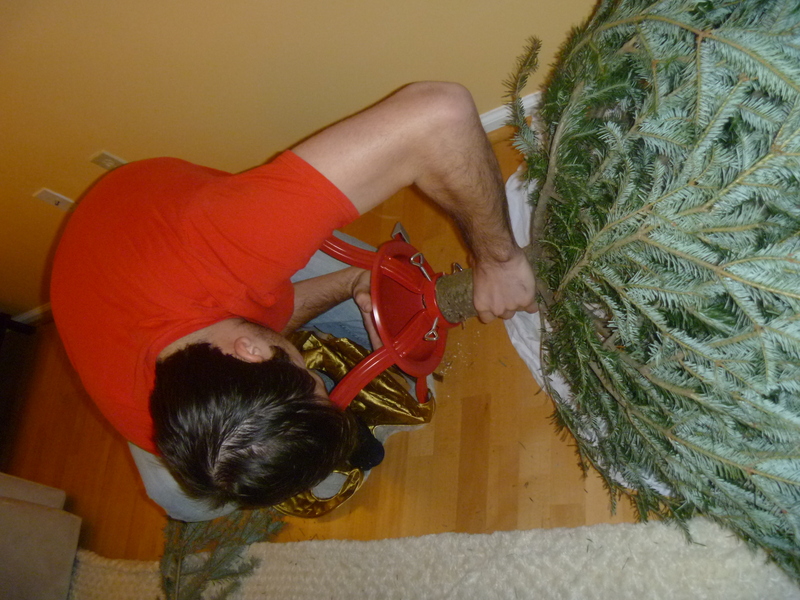 Chris was excited by the authentic pine tree smell, and he also got to show off his newly acquired handy-man skills. It didn’t fit. Chris had to scrape off the sappy bark with a steak knife. It worked perfectly and while we may have 1 less steak knife, we now have an arts & crafts knife. Win-win! We used red and gold as our color scheme. Anything more than 2 colors starts to look tacky in my opinion, and while some people define Christmas as tacky, I like to keep it simple. 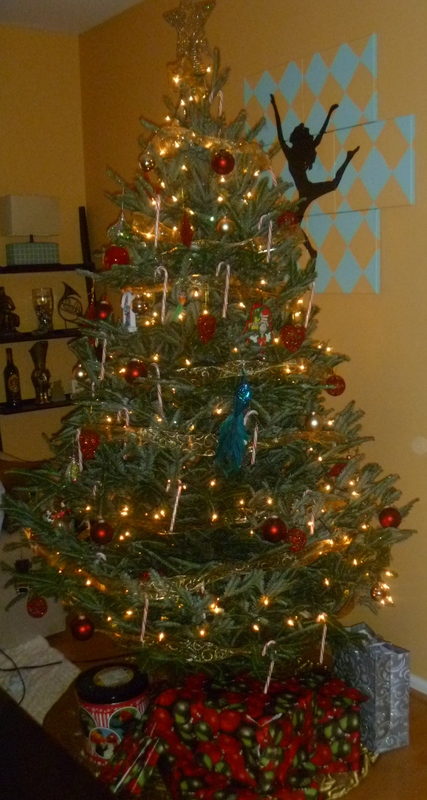 Candy canes are a must on any tree. 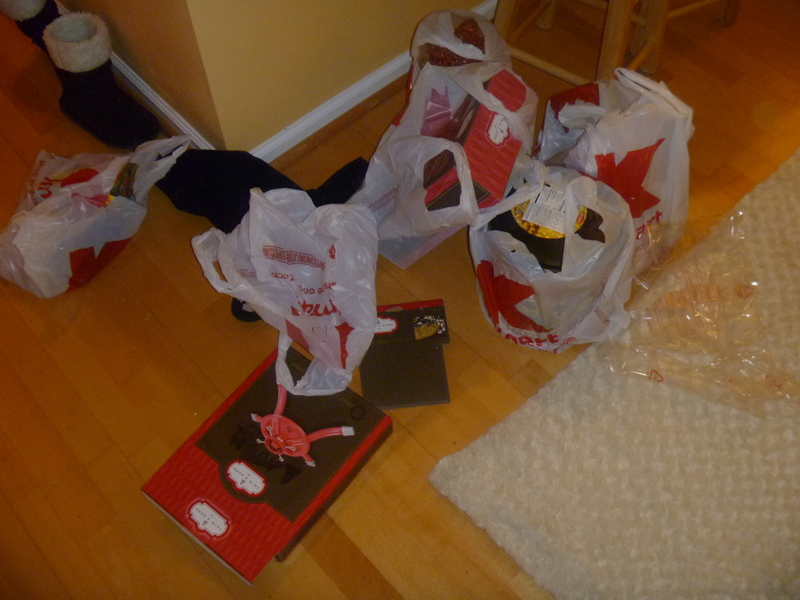 We bought 4 boxes and have probably eaten half of that since. Eating food straight off a tree, how much more natural can we get! Fully ornamented with star on top and popcorn bin underneath. Above you can see the light snafu I mentioned earlier. We only bought 150 lights, thinking that was plenty. By the time we had realized it wasn’t, we were in our sweatpants with Christmas music blaring and hot chocolate in the microwave. It took another week and a half before her bottom was lit up. (The peacock perched above is a prelude to my New Years Eve attire). 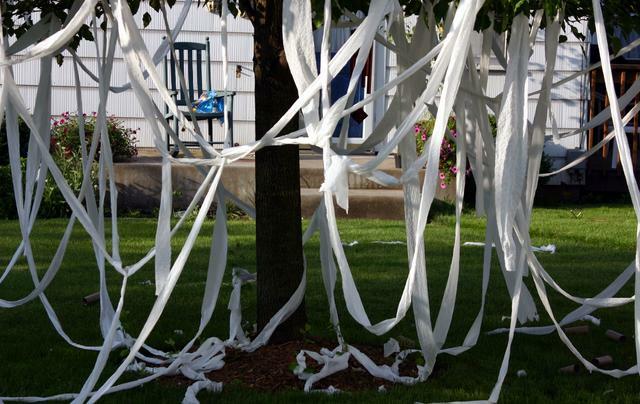 Here is a close up of the “snow” we used for the first and last time. It was essentially a bag of glitter that now comes to work with us on our faces, coats and shoes. Every inch of our floor, even after several sweeps, now sparkles with faux snow. Opt out. 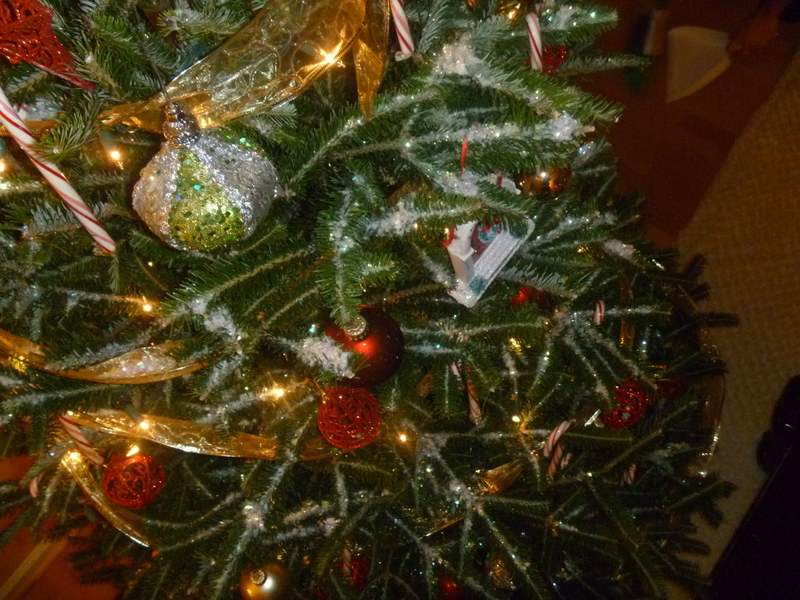 Decorating a Christmas tree is a fun tradition at any age. It brings families together and enhances the holiday spirit. With work, school and other obligations, the last week of December can sneak up on a person. 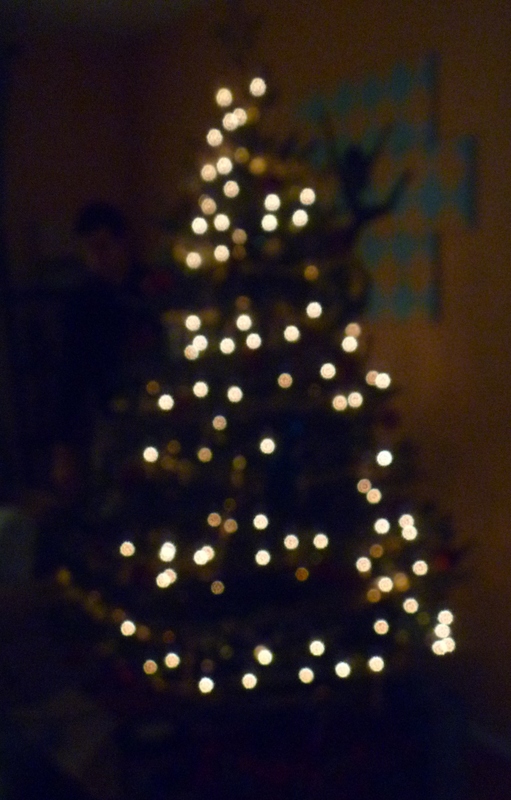 But there’s no forgetting the holiday joy when you come home to a tree that you decorated with your loved ones. Merry Christmas!